If you're a fan of comfort dressing when it comes to your personal style, you'll love this stylish combo of a light blue vertical striped off shoulder top and adidas originals fashion league shorts. For something more on the daring side to complement this look, go for a pair of white leather flat sandals. If you're in search of a casual yet chic ensemble, wear a black and white bomber jacket and adidas originals fashion league shorts. Both items are totally comfy and will look fabulous paired together. Bring instant glamour to your getup with blue leather pumps. If you're hunting for a casual yet totally stylish outfit, go for a black leather biker jacket and adidas originals fashion league shorts from farfetch.com. Both garments are totally comfy and will look fabulous paired together. Make white leather gladiator sandals your footwear choice for a more relaxed vibe. If you're on a mission for a casual yet absolutely chic look, wear a white lace turtleneck with white shorts. Both garments are totally comfy and will look fabulous paired together. When it comes to footwear, this look pairs nicely with white leather heeled sandals. If you're in search of a casual yet totally stylish ensemble, consider teaming a light blue long sleeve blouse with adidas originals fashion league shorts from farfetch.com. Both items are totally comfy and will look fabulous paired together. For something more on the daring side to finish off this ensemble, opt for a pair of white leather thong sandals. If you don't like being too serious with your combinations, go for a light blue denim shirt and adidas originals fashion league shorts. Choose a pair of beige leather pumps to kick things up to the next level. If you don't like getting too predictable with your combos, pair a pink open cardigan with adidas originals fashion league shorts. Opt for a pair of tobacco leather flat sandals to make the look more current. If you don't like getting too predictable with your ensembles, wear a white crew-neck t-shirt with adidas originals fashion league shorts from farfetch.com. Choose a pair of black suede gladiator sandals for a more relaxed aesthetic. 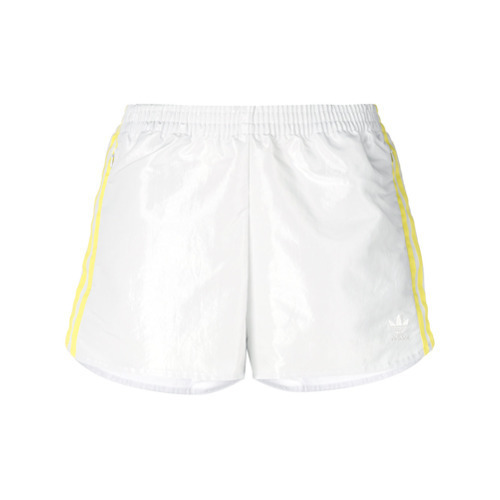 A white blazer and adidas originals fashion league shorts from farfetch.com is a wonderful combo to carry you throughout the day. Up the cool of your ensemble by rounding it off with white leather heeled sandals.